Aged Care Financial Advice | Specialist Aged Care Financial Advisers. Getting started with aged care financial advice can seem daunting when your main concern is the welfare of your loved ones. Do I keep or sell the home? These are just some of the basic questions that come to mind when you’re thinking about aged care and retirement planning. Doing it all by yourself can be overwhelming. It’s already an anxious time for your family and the last thing you want is to get things wrong when it comes to the finances. This is why most people opt to work with a aged care financial adviser. By letting an expert handle the complicated aspects of care, you can focus on the wellbeing of your family members. Why Do You Need Financial Advisers Specialising in Aged Care? As you already know, there is a lot of information on care and retirement planning. Going through it all and trying to make the right decision for your loved ones can be confusing. This is where an adviser steps in. These experts have a wealth of knowledge and can provide you with aged care financial advice that is unique and relevant to you. Aged care financial advisers can help you focus on the information that matters and filter out the noise. Financial advice is complex and different financial situations will require different strategies and approaches. When you work with an aged care financial services adviser, they will make sure you have a strategy that is tailor-made for you. When you seek out aged care financial advice, your adviser will assess your unique situation and advise you on the options available to you. While you may be looking for aged care financial advice alone, another person may want to learn more about retirement planning or need advice on investments. There is no one-size-fits-all strategy and an adviser can help you wade through the sea of options to narrow down on the aged care finance solutions that are suitable for you. While getting help with aged care, you want to make sure you’re also making the right choices and decisions to ensure you don’t lose out on Centrelink pension payments. A financial adviser in aged care will know exactly what to do. By making the right assessments about your income, assets and other details of your financial situation, they can help you maximise Centrelink payments and reduce costs all around. When you’re looking for aged care financial advice, you want to make sure you are consulting with advisers who understand your situation and are experts in the area. At Core Value, we are financial advisers specialising in aged care. Our team has well over 10 years of experience in developing strategies and aged care financial solutions for clients. Looking for aged care financial advice in Sydney? Looking for aged care financial advice in Melbourne? 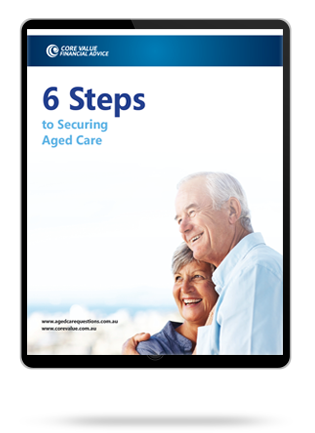 Looking for aged care financial advice on the Gold Coast?